The Oster Countertop Microwave Oven has 1,000 watts of total cooking power and 10 adjustable power levels for customized cooking. There are one-touch cook settings for potato, popcorn, pizza, beverage, frozen dinner and reheat, as well as a defrost function set to speed or weight. 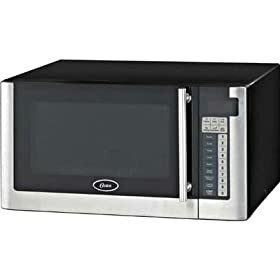 Each 1.1-cubic foot microwave comes with a digital clock and cooking timer for cooking those items that don't have individual presets. The microwave oven has a push button door and even comes with a programmable child lock that prevents unsupervised use. The premium stainless steel design makes this microwave both functional and stylish. Oster products offer the means to express your inspiration, making creativity a joy. Cooking, entertaining and sharing with friends and family are more satisfying than ever. We promise to provide expert knowledge, innovation, exceptional performance, versatility and perfect results every time.